We are made of history!! Follow our quick introduction to Madrid early in the morning. The Scrooser is unique! There is nothing like Scrooser, because it´s the first one in its category. Scrooser is the original and German-made vehicle, which is reliable and safe. Scrooser is approved by the EU regulations. The Scrooser revolutionizes the way of driving along sidewalks, it also brings the pleasure of driving in the most ecological way. Both elegant and innovative design cause an ability to move with an outstanding style. Only one problem - you won't want to get off. If you´re looking for the most original Tour, this one is for you! 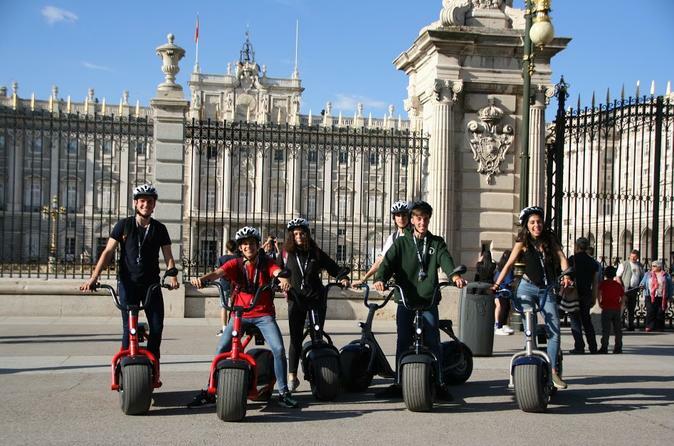 You´ll be able to get to know the capital of Spain effortlessly, safely and all while being a friend to the environment. Guided by a helpful local guide who accompanies you in your adventure, you´ll be told stories and anecdotes about Madrid. You´ll be taken to the most incredible places as well as main monuments, therefore your visit to Madrid will be unforgettable. finished the works of this magnificent Palace, Francesco Sabatini. able to see two sets of lined statues, all of them represent former Kings of Spain. the main side of the Royal Palace and in front of it Almudena’s Cathedral. more than 400 years of history. Opera of Madrid) and the curious equestrian statue of the King Felipe IV.